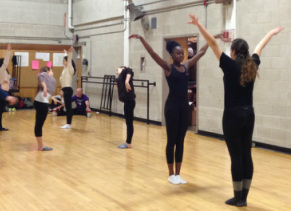 BHS dance students took part in an exciting three-part dance improvisation series with master teacher Olivier Besson on February 28 and March 7 and 17, 2014. This series was sponsored by a generous grant from FoPA written by Kathleen Exar for the benefit of intermediate and advanced dancers in the BHS Dance Program. 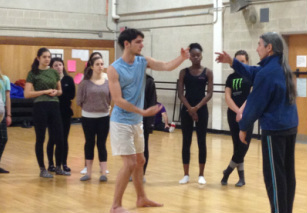 Mr. Besson's work allowed students of Ms. Exar and Ms. Hernandez to experience wonderful insights into behind-the-scenes improvisational studies that can support the creation of new works or allow dancers to explore movement in exciting new ways. Group and partner collaborations were produced instantaneously, as dancers were freed from usual constraints they sometimes put on themselves when studying technique alone. "We learned how to take small or everyday motions and turn them into a dance. I learned how to blend my movements with a partner and then switch control of movement while blending our motions together." "The dancer shapes the space and as the shaper dances, they shape the other dancers, as well as the dance." "It was really an eye-opening experience to get to try something so different."